A Solar Halo appears when the sun shines through thin and feathery ice clouds floating very high in the sky. These clouds are called Cirrus clouds and, when they exist, are the highest clouds in the sky. The ice crystals bend the sunlight just like a prism. 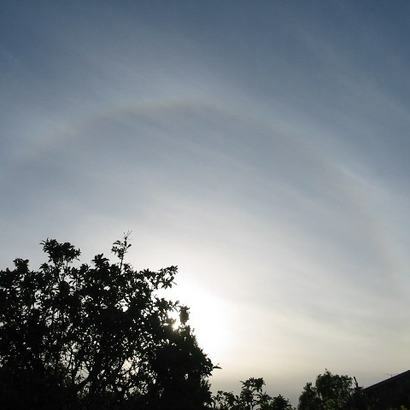 The diameter of the halo is determined by the shape of the earth. This fine example of a 22 degree Solar Halo was taken on May 3 2004 in Dundee, Scotland, by Keith Edwards from the University of Dundee in Scotland.